Peggy was the daughter of James BARNETT Jr. and Jane WILLIAMS. 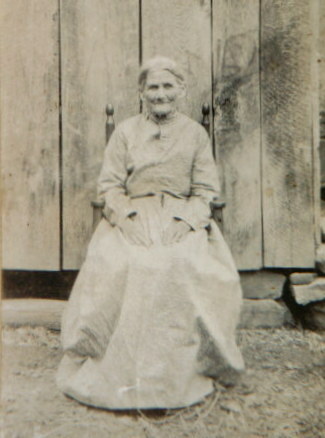 She was born in 1844 on Big Ridge, Scott Co., VA. She is buried at Barnett Cemetery on Big Ridge, the date of her death is not known. Photo is the property of Jean Brand. I have been serching lately and I think the father of Susannah “Susie” Barnett b-1828, was James Barnett, Sr and mother was Mrs. Mary Rebecca Barnett. Her brother would have been James, jr. who married Jane Williams. There has been some confussion as to whether she is the daughter of one James or the other. James Jr was married in about 1828 so Jane Williams would have only been about 13 in 1826. On the other side, Mary Rebecca would have been 43 in 1826. (1) Martha b-1852 could this be the bride of Ira Sparkman? They had 3 children, Phillip, Ailee or Haley and ?Mary. They were raised by Sparkmans after Ira’s death. Martha re-married but I do not know to whom. Ailee Sparkman married Felix Wells. (2) Esther b- 1859 could this be the bride of Amos Bays? They moved from Kentucky to Ohio and had 2 children, Oscar Clay Bays and Charlotte Mae Bays. she probably died bef 1890 because he remarried Emma Salyer. Oscar, Charlotte and 2 more children are listed on 1900 census with Amos and Emma, showing they had been married 10 years. Amos moved back and forth from Ohio to Kentucky where he was born as was all of his wives. (He was married 2 times before Esther and 2 times after Emma.) I assume Emma died bef 1910 because Amos is on the 1910 census with Emma’s 2 children and no Emma. Anyone able to confirm or dispute? Still searching on Susannah Barnett b-1826 VA and William Gillum. Does anyone know if Susannah ties into this Margaret Barnett’s (pic) family. I have Susannah’s parents as James Barnett & Mary Rebecca Gillum. Can anyone confirm this?